Peter is principally responsible for our Austria and Germany programs. His quick wit and affinity for the good life make him a pleasure to tour with. He also leads wine tasting tours through Burgundy, France. His fluency in German and French, attention to detail, and fun loving nature make him a perfect fit for these departures. 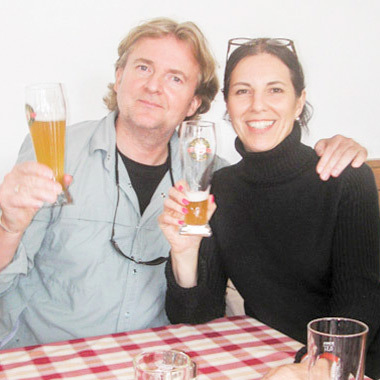 Maria assists Peter on the Austria and Lake Constance cycling programs. She offers a unique insight on these two beautiful regions. Check out Peter's new gallery in England here. We had an absolutely wonderful time on the Romantic Road with you. Thank you so much for your patience and for the historical lectures. We hope to join you again in the future. We had a wonderful experience. The weather was nearly perfect and we felt priveledged to be a part of a group that was so friendly and interesting. The tour guides, accommodations, and dining were superb! Enjoyed the personal touch of going to leaders' home for wine and cheese. It was a good thing we had a light lunch, the amount of food was just right! I enjoyed the tour very much and appreciated the daily mileage options. You organization and management of the logistics was simply excellent.